Paradise Palms and Pasfields Restuarant allow visitors to enjoy panoramic views against a backdrop of sheltered banana-clad hills. With acres of space to roam and play you get a sense of not being crowded. The resort's environment is green and vibrant with a billabong and water aspects set amongst palms, tropical trees and shrubs. Paradise Palms Resort offer affordable Coffs Harbour accommodation for families, couples, groups and weddings - We even have our very own wedding chapel so we can offer onsite wedding accommodation to your guests. So whether you are visiting North Coast NSW as a young couple, a family or in your retirement spend a little time in our paradise for the perfect getaway. Our Polynesian styled bures create a sense of the exotic, relaxed lifestyle making Paradise Palms Resort in North Coast NSW an ideal place to stay and unwind, in spacious settings for those seeking the different. Our Coffs Harbour Accommodation is ideal for couples, families and groups large and small visiting North Coast NSW. While our romantic bures are the preferred couples accommodation, our villas and apartments are perfect for larger groups and families. We are also able to accommodate any guests who attend weddings at our very own wedding chapel. 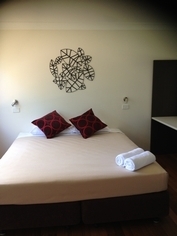 All rooms equipped with 24 free Austar channels and free wifi. 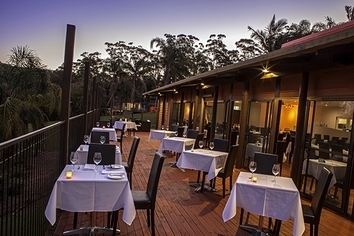 Room service, casual bar and balcony restaurant dining or sensational a la carte all start 5pm daily. See www.pasfieldsrestaurant.com.au or call for seasonal breakfast options. Rates are for 4. Bedding configuration 1 x Queen Bed, 1 x Sets Bunk Beds or 2 singles. Fully self-contained Apartment with air-con and nice outlook from balcony. Rates are for 6. Bedding configuration 1 x Queen bed, 2 x Sets Bunk Beds. 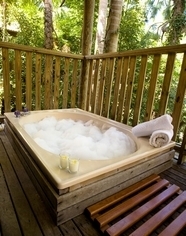 Self-contained Polynesian style Bure with air-con & private balcony. Rates are for 7. Bedding configuration is 2 x Queen Beds, 3 Single beds. 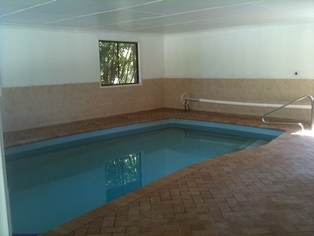 Fully self contained Villa with air-con, garage, carport and laundry. Ideal for families with children. Rates are for 5. Bedding configuration is 1 queen bed, 1 double/single bunk bed. Self-contained open plan Polynesian style bure with air-con & private balcony. Check in 2.00pm - 8.30 pm. If you would like to organise early check in and check out please contact reception. Pasfields Restaurant serves dinner, pizza, casual bar dining or scrumptuous a la carte or room service from 5. 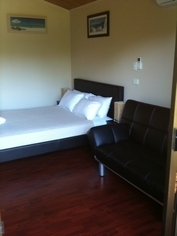 Foldaway bed, Porta-cot with linen, Stroller, and Hi-Chair can all be hired from the resort. Prices are available on application. Day visitors using facilities are charged please contact reception for information. Free car parking is outside all rooms. Parking available for boats, trailers, buses. 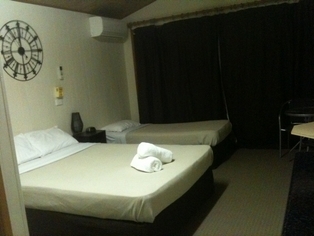 We are located 6 kms from the middle of town or 3.5 kms from the Park Beach Plaza and Big Banana. If coming from Sydney, go 3.5 kms past the big banana and we are on the left hand side. The Coffs Harbour area has many attractions including outstanding surf beaches, fishing, boating, white-water rafting, horse riding, bush walking, rainforest tours, clubs and restaurants. Reception offers discounted tickets and staff are happy to recommend suitable attractions for the whole family.